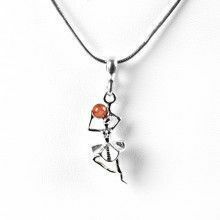 This lovely piece of jewelry features the likeness of a beautiful butterfly. It can function perfectly as either a pin, or a large pendant. 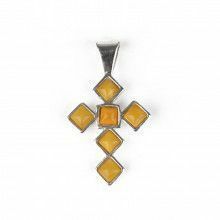 The shape of the butterfly is intricately constructed out of genuine .925 sterling silver, while the wings of the butterfly are made of gorgeous and natural honey amber. 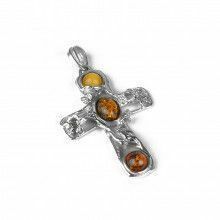 Pendant/Pin Approximately: 1 3/8" x 1 3/4"
Larger Amber Stones: 9/16" x 3/4"
Smaller Amber Stones: 7/16" x 11/16"